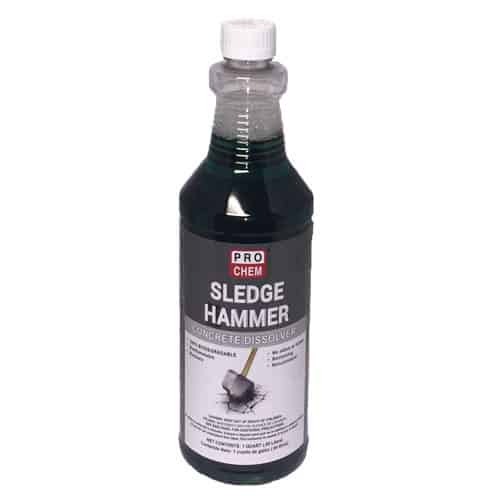 SLEDGE HAMMER | Pro Chem, Inc.
*1 Gallon covers approximately 250-300 square feet. IMPORTANT: Never wet surface before applying! Completely saturate the area of hardened concrete to be removed with undiluted product using a sprayer or conventional brushing. The surface will turn white upon contact with the product, then darken. Allow it to remain on cement for at least 20 minutes. Treated cement can be left to react overnight. If allowed to evaporate, white residue will appear-DO NOT RINSE. Reapply product to reactivate as needed until concrete is softened to mush. Heavy buildup may require additional applications. Rinse with cold water via a high-pressure washer (1,000-3,000 psi).